This is the earpiece your grandad might have used with his first transistor radio. The sound is tinny and the tip is not soft, but we have found from many of our customers that this earpiece is exactly what they want. The earpiece is easy to put in, it stays put, it is easy to clean and the bright sound is just great for listening to books on tape or the announcer at the ball game. So, for all of you who have begged us to bring back the grandad earpiece, here you go. Got Ears? Grandad Style Monaural Earpiece With 6 Foot Cord5FredJanuary 28, 2019Very hard to find. Inexpensive but work very well for monaural listening. Got Ears? Grandad Style Monaural Earpiece With 6 Foot Cord5Rolf K. SvenssonJanuary 7, 2019Works fine. Delivery took some time and the tracking information halted when the parcel reached Chicago. Got Ears? Grandad Style Monaural Earpiece With 6 Foot Cord5Anne W.January 4, 2019Excellent product. Hard to find but Ear Plug Store keeps them in stock, sells them for a great price, ships quick, and is a responsive vendor. Thank you! Got Ears? Grandad Style Monaural Earpiece With 6 Foot Cord5WendyDecember 27, 2018Excellent service from the company. Ear plugs are great and hard to find these days. Got Ears? Grandad Style Monaural Earpiece With 6 Foot Cord4J. KerelJuly 8, 2018Good product for the price. Got Ears? Grandad Style Monaural Earpiece With 6 Foot Cord5BobMay 22, 2018Just what I wanted. Works great for me. Got Ears? Grandad Style Monaural Earpiece With 6 Foot Cord5Kim BucknoleMay 10, 2018So useful, so hard to find except at www.earplugstore.com. Indispensable! Irreplaceable! Got Ears? Grandad Style Monaural Earpiece With 6 Foot Cord5Peter OcchionMarch 9, 2018They work great, use them for hunting so the game can't hear the he talking. Got Ears? Grandad Style Monaural Earpiece With 6 Foot Cord5SIDJanuary 10, 2018I'm a grandad. This was made for me! Works as advertised. Delivery was fast. Got Ears? Grandad Style Monaural Earpiece With 6 Foot Cord5KenDecember 28, 2017Good monaural earpiece but cord is too short. Cord should be at least 8 feet long. Got Ears? Grandad Style Monaural Earpiece With 6 Foot Cord5SusanDecember 15, 2017This item is surprisingly hard to find in stores (esp. now that Radio Shack is gone), so I was very happy to find it on this site. The person I talked to (to verify plug size) was very helpful. Delivery was very fast, the price certainly can't be beat, and the earpieces were exactly what I wanted. Got Ears? Grandad Style Monaural Earpiece With 6 Foot Cord5Don BentleySeptember 22, 2017Great product, super price and quick delivery. Got Ears? Grandad Style Monaural Earpiece With 6 Foot Cord5MikeSeptember 20, 2017great! Just what I was looking for for falling asleep listening to my transistor radio in one ear. Got Ears? Grandad Style Monaural Earpiece With 6 Foot Cord5Robert W StevensAugust 30, 2017My first order! Service was super!!! I had been buying these from Radio Shack in the past at $6.00 a piece. I'll have to remember your web site in the future. Got Ears? Grandad Style Monaural Earpiece With 6 Foot Cord5HelenAugust 1, 2017Searched for a long time for these earphones. My Mother prefers them when listening to radio in bed. Very happy with the product. Fast shipping - product as described and pictured. Got Ears? Grandad Style Monaural Earpiece With 6 Foot Cord5ZoeJune 4, 2017Thanks for being so customer pleasant. Delivery was prompt and plugs did not disappoint. Got Ears? Grandad Style Monaural Earpiece With 6 Foot Cord5Fud zavackiMay 17, 2017Not the easiest item to find these days, but I sure do love 'em! My 7 year old son uses his for late-night AM DXing in his bunk! Great selection, excellent prices and fast shipping. I LOVE this place! Got Ears? Grandad Style Monaural Earpiece With 6 Foot Cord5JanRoOctober 1, 2016The Grandad Monaural earpiece works fine, stays in ear well, comfortable, and you cannot beat the price. Please always carry these!! Got Ears? Grandad Style Monaural Earpiece With 6 Foot Cord5Michael DalfonsoAugust 13, 2016I like to listen to the radio after going to bed, and this ear piece with the long cord is perfect. I can easily roll to the other side without pulling the radio off the stand. If I fall asleep with the earbud in, it does not hurt my ear. The fidelity is certainly not concert quality, but who needs that if they are only listening to talk and a little pop music. Got 20 this time just in case they become unavailable. Hope you keep selling them. Got Ears? Grandad Style Monaural Earpiece With 6 Foot Cord4Gloria LevittJuly 29, 2016Love these. Use them while lying down so only need one earpiece to be comfortable and listen to my audio books. Got Ears? Grandad Style Monaural Earpiece With 6 Foot Cord4CatherineJune 2, 2016Good, way better than the modern 'buds' The ear piece is shorter than the old fashioned ones & falls out a bit & the cord is really really long. Got Ears? Grandad Style Monaural Earpiece With 6 Foot Cord5DaveMay 8, 2016I do listen to the radio most nights and they don't fall out if you put the cord behind your ear. These are great for the money. Got Ears? Grandad Style Monaural Earpiece With 6 Foot Cord5anthony amatoFebruary 25, 2016Very good buy, these are better and last longer thanthe ones i use to buy at Radio Shack. Got Ears? Grandad Style Monaural Earpiece With 6 Foot Cord4ArtFebruary 12, 2016Tinny sound and the ear plug falls out, but happy to find this product anywhere. apparently not too many people listen to the radio in bed. Got Ears? Grandad Style Monaural Earpiece With 6 Foot Cord5BobFebruary 3, 2016These are great. A bargain compared to Radio Shack. At first I didn't like the long cord. It kept catching on things. Then I simply looped it back and forth right on the cord until it was the length I wanted. Then a piece of masking tape to hold each end of the multiple loops as an attachment to the cord and the problem was solved. Works like a charm. Eat your heart out Radio Shack. Got Ears? Grandad Style Monaural Earpiece With 6 Foot Cord5JJacksonqhs62January 11, 2016I am deaf in left ear. Searched for mono ear plug to listen to devices without a headset or ear clip. This fits perfectly, stable enough to last if caught or pinched. None of molded ones fit or stayed in my ear. This plug stays in my ear and is exactly what I wanted. I was extremely pleased after searching different to find sites this old style ear plug that works so well. Sometimes when you keep reinventing the wheel, it is no longer round. Got Ears? Grandad Style Monaural Earpiece With 6 Foot Cord5MickeydalonsNovember 2, 2015Could not find at Radio Shack or anywhere else. I use at night on my clock radio, and it does not hurt my ear if I lie on it. Good price and quick delivery. Got Ears? Grandad Style Monaural Earpiece With 6 Foot Cord5Lawrence OreOctober 19, 2015This is a great earpiece. I listen to radio dramas at work when working on projects. This device allows me to ride along with the Lone Ranger, the Green Hornet, the Inner Sanctum, and Dragnet without bothering the work environment. It also works well with talk radio. I highly recommend it. Got Ears? Grandad Style Monaural Earpiece With 6 Foot Cord5Tom from UKSeptember 2, 2015Excellent value even including carriage ! I can't get these older style ear pieces anywhere in England nowadays and am just glad to have found a supplier. Just the job for listening to the radio in bed . Accurately described and sent quickly. I'm very pleased ! Best wishes to you all ! Got Ears? Grandad Style Monaural Earpiece With 6 Foot Cord5Randall BettisJuly 27, 2015Fits well, works great. Got Ears? Grandad Style Monaural Earpiece With 6 Foot Cord5BernardoJuly 5, 2015I am very glad to have found this supplier. I have been using these for years to listen to the radio as I lay in bed unable to sleep at night. My last one just stopped working and I bought these new ones and they work just fine,a very happy customer,thank you. Got Ears? Grandad Style Monaural Earpiece With 6 Foot Cord5garyJune 24, 2015I am a granddad so I guess it was time. This particular radio I use them for (Sony 2010 multiband) are perfect. Other headphones have too much bass. I listen mainly to am talk, shortwave and ham radio. These are perfect for clear audio. Got Ears? Grandad Style Monaural Earpiece With 6 Foot Cord4PaulaMay 28, 2015Great price! Would like a shorter, thicker earpiece: they fall out easily but they suit my purpose. Got Ears? Grandad Style Monaural Earpiece With 6 Foot Cord5Kim BucknoleMay 3, 2015I use these to listen to radio (drama, comedy, documentaries, not music), on my iPhone when I am in bed. These are perfect for this use. Eventually the thin cable will fail but I always have several in reserve. These used to be universally available but for some years now I have bought from this store online. Got Ears? Grandad Style Monaural Earpiece With 6 Foot Cord5GloriaApril 1, 2015Just what I needed!! They work well I listen to audiobooks in bed while lying down and do not like lying on earbuds. These are perfect. Good sound in free ear. Got Ears? 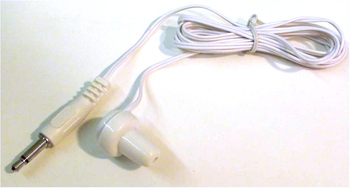 Grandad Style Monaural Earpiece With 6 Foot Cord4JaneMarch 23, 2015Glad to find this item . I use it to listen to audio tapes in bed and I lay on one side so the 2 bud kind don't work for me. The price is right and they work fine but I wish there was a more sturdy alternative. These are delicate and don't last long. I'd gladly pay a bit more for better quality but they don't seem to exist. Got Ears? Grandad Style Monaural Earpiece With 6 Foot Cord4LeeMarch 2, 2015If you are like me & have trouble hearing the higher tones, then these will work great for you. I do recommend these for the quality & excellent price. Got Ears? Grandad Style Monaural Earpiece With 6 Foot Cord4KarenFebruary 26, 2015I was delighted to get a package of 10 6-foot long earbuds at such a savings. The ear-bud part was much longer than expected and at first I thought it was a problem. But I am getting used to them and the sound quality is okay. Got Ears? Grandad Style Monaural Earpiece With 6 Foot Cord5TomDecember 10, 2014I'm a grandad who uses this earphone to listen to the radio in bed. The price is outstanding and the quality is very good. I order 20 at a time because after I fall asleep the wires sometimes get tangled up in the pillows and blankets and the wires get pulled out. So I always need a spare and these are a great inexpensive option to any electronics store product. Please don't stop carrying this product. Got Ears? Grandad Style Monaural Earpiece With 6 Foot Cord5ShirleyNovember 25, 2014Granddad Style monaural earphone. Meets my needs perfectly. Enables me to watch my big screen tv with my earphone plugged into a smaller TV. My family can have normal sound on the large TV and I can hear it with my earphone. Thank you for continuing to provide Granddad style monaural earphones for those of us with a hearing deficit. Got Ears? Grandad Style Monaural Earpiece With 6 Foot Cord5TimNovember 4, 2014Exactly what I was looking for, work great. i think that 5.00 shipping for such a small item was too much,but the low price of the item kinda made up for it. the shipping was also very fast. Got Ears? Grandad Style Monaural Earpiece With 6 Foot Cord5MarcOctober 3, 2014These are great! We use them for our tour business and provide them for our clients to use with our transmitter/receiver system when on tour so they can hear the guide's presentation without having to stand close. Unlike other earbuds, these fit in everyone's ears easily and are not too large for some people. Finally, we've found the right product for our needs. Thank you! Got Ears? Grandad Style Monaural Earpiece With 6 Foot Cord5JohnAugust 13, 2014The sound quality was very good even with music Like other reviewers, I principally listen to voice from CBC, PRI and NPR etc so they are perfect. The earphone is actually more comfortable than the Radio Shack ones by being a slightly smaller diameter. I do find the name of these earbuds somewhat insulting. It presumes no under under 70 would require such a device or that Grandma would never use them: drop the Grandad style Excellent product despite the ageist name. Got Ears? Grandad Style Monaural Earpiece With 6 Foot Cord5Garry LennardJuly 29, 2014I am a return customer. I could not locate a similar product in Adelaide. I really like the 6 foot cord and the comfortable earpiece which is shaped well to be inserted in the ear. Most new ones are buds which I find drop out of the ear far too easily. Happy to recommend this product. Got Ears? Grandad Style Monaural Earpiece With 6 Foot Cord5Murray FisherJune 19, 2014This is exactly what I was looking for. Finding this product is difficult in Australia. Thanks to the Earplug Super Store my order was posted promptly and I can enjoy my radio listening at night without disturbing other family members. Got Ears? Grandad Style Monaural Earpiece With 6 Foot Cord5MargriteApril 19, 2014I really prefer this type of earplug and it's good to find a place that still sells them. Great Product and fast delivery not to mention a great price! Got Ears? Grandad Style Monaural Earpiece With 6 Foot Cord5donnaApril 14, 2014works okay, just wish they had the 10 ft cord. Got Ears? Grandad Style Monaural Earpiece With 6 Foot Cord5FrankApril 2, 2014This earpiece was EXACTLY what my wife was looking for to replace an old one that finally broke. I searched for hours on line until I finally found the EARPLUG SUPER STORE's website. Their prices are great and they shipped my order immediately. Got Ears? Grandad Style Monaural Earpiece With 6 Foot Cord5anthony calvelloMarch 20, 2014excellent product .fits the bi9ll for me. Got Ears? Grandad Style Monaural Earpiece With 6 Foot Cord5GaryJanuary 27, 2014I use them for my Sony 2010 radio strictly for voice on AM, SW, Ham radio at night . I keep the radio under my bed, so the 6 ft cord is a welcome blessing. RadioShack used to have a 6 ft earphone, but now only 3 ft. I used to need almost all the volumn. Now, hardly any to get great audio. Got Ears? Grandad Style Monaural Earpiece With 6 Foot Cord5KMBDecember 22, 2013Great product! Got Ears? Grandad Style Monaural Earpiece With 6 Foot Cord5SteveNovember 25, 2013Great mono earplug. Great price for a great product. Fits and stays in my ear. The cord is soft and flexible, preventing tangles and breakage. Similar items not available anymore at Radio Shack. Superior to ear buds for my transistor radio. Got Ears? Grandad Style Monaural Earpiece With 6 Foot Cord5MarkSeptember 20, 2013As others have said. This is the only ear plug like this left on the market. I have had some last for a few months, others fail within a week or two. For price and use, these are a good buy. For those who say ear buds replace these; they don't. I hate ear buds because they fall out and are uncomfortable. Got Ears? Grandad Style Monaural Earpiece With 6 Foot Cord5SteveJuly 17, 2013Just move down to Linda's review... Exact same for me! Perfect for falling asleep with the tv on a timer. I've used cheap earbuds (cutting off one "bud") a number of times, but it falls out too easily AND the cords on those things are so darn short. The cord length on this earphone is not something to overlook! Got Ears? Grandad Style Monaural Earpiece With 6 Foot Cord5WilliamJune 2, 2013Excellent product...and opposite to some other comments, they are well made and have do have plastic shield connection pieces to aid durability... Just want I wanted...!!! Got Ears? Grandad Style Monaural Earpiece With 6 Foot Cord5LindaMay 29, 2013I LOVE these and can't live without them! I always listen to the TV at night with them and set the sleep timer on the TV to fall asleep with the earplug in my ear. Please NEVER stop making them!! Got Ears? Grandad Style Monaural Earpiece With 6 Foot Cord5ErnMay 15, 2013Couldn't be more pleased with the product and the prompt service. Thank you. Got Ears? Grandad Style Monaural Earpiece With 6 Foot Cord5todApril 3, 2013like all other reviews, buy a boat load of these they crap out soon but no other options this cheep out there? Got Ears? Grandad Style Monaural Earpiece With 6 Foot Cord5SarahMarch 27, 2013I have been using these for years but find that their life has become shorter due to no protection on the cord at either end. Years ago there was about a 1/2 inch of clear plastic @ each end that fitted around the wire which prolonged it's life. I use these in bed (to listen to the radio) if not they would fall out. In general I would rate them 8/10. Got Ears? Grandad Style Monaural Earpiece With 6 Foot Cord5J.askyNovember 10, 2012Good product except the connection to the jack (output) keeps breaking after about 2 weeks of use. Got Ears? Grandad Style Monaural Earpiece With 6 Foot Cord5JohnMay 29, 2012The price is right but the wire wears out quickly. Got Ears? Grandad Style Monaural Earpiece With 6 Foot Cord5hooked on radioMay 10, 2012Exactly what I was looking for. Good product; fast delivery; happy customer. Got Ears? Grandad Style Monaural Earpiece With 6 Foot Cord5Gerry GerardApril 27, 2012They are comfortable to wear and give clear sound. Got Ears? Grandad Style Monaural Earpiece With 6 Foot Cord3John FlandersApril 27, 2012I use this earpiece with a monitor radio. The life expectency with gentle use on my side is 2 to 5 days. I woild like to find a product with a sturder cord connection, but they all seem to be manufactured at the same facility in China. Got Ears? Grandad Style Monaural Earpiece With 6 Foot Cord5Rose T O'BrienApril 3, 2012I was so pleased to find this. My only regret is that they no longer come in longer lengths. Got Ears? Grandad Style Monaural Earpiece With 6 Foot Cord4DAVID LOURIEFebruary 26, 2012Work great in most devices. However, plug does not fit properly in Sansa Clip MP3 player. It keeps cutting off when fully inserted, and falling out when it is partially inserted. Got Ears? Grandad Style Monaural Earpiece With 6 Foot Cord5Craig from Decatur, ILFebruary 25, 2012Just what I was looking for. Ordered 10. Better than the ones I could no longer find at Radio Shack and costs a lot less. Got Ears? Grandad Style Monaural Earpiece With 6 Foot Cord5mikeFebruary 23, 2012Exactly what I wanted. thank you !! Got Ears? Grandad Style Monaural Earpiece With 6 Foot Cord5Jane from DetroitDecember 20, 2011So glad I found these for my father. Good and quick service. Got Ears? Grandad Style Monaural Earpiece With 6 Foot Cord5Barry GerberDecember 19, 2011For some uses, complicated stereo earbuds or headphones are really overkill. It's so good to find a simple, inexpensive low-fi mono earplug. Use it with my iPhone, iPad and Kindle Fire. Also, use it at night to fall asleep to MP3s of classic radio shows. Got Ears? Grandad Style Monaural Earpiece With 6 Foot Cord5GayleDecember 15, 2011Great service and product. Thank you! Got Ears? Grandad Style Monaural Earpiece With 6 Foot Cord4KenNovember 30, 2011Great Bargin. Can't give 5 stars because they don't seem to last too long. But last long enough for the price. Initially bought 5, got down to my last one and decided to by 20 more. Some seem to last longer than others. Got Ears? Grandad Style Monaural Earpiece With 6 Foot Cord5Garry LennardSeptember 15, 2011I received my order today in good condition. The product was everything I had hoped for. I could not find an equivalent earpiece in Australia. All local suppliers were happy to fob me off and say 'its no longer available'. Thank goodness for your website. I now have the earpiece I wanted. Delivery from US took 10 working days which was great. Happy to recommend your company. Got Ears? Grandad Style Monaural Earpiece With 6 Foot Cord5JumpDogJune 30, 2011yup it works just like I remembered from my youth. great for listening to podcasts at my desk. quick delivery, great price. Got Ears? Grandad Style Monaural Earpiece With 6 Foot Cord4SandyMay 20, 2011Previously ordered and very satisfied so reordered. The earplug lasts several months so I ordered quite a few at a great price. Well worth it! Got Ears? Grandad Style Monaural Earpiece With 6 Foot Cord5MikeApril 4, 2011Item has a minor flaw - wrap it around the radio and ultimately the cord will break at the plug in. Since the cost is so great (got 3 sets for under $10 this time), it's a flaw I can live with. I frequently eat out by myself and love to listen to my old fashioned radio in restaurants. Went to a Radio Shack last month and asked the young man if they had ear phones for a "transister" radio. He gave me a blank expression and said "I don't know what that is." Got Ears? Grandad Style Monaural Earpiece With 6 Foot Cord5JSRFebruary 25, 2011TERRIFIC ATTITUDE AND SERVICE BY EARPLUG SUPERSTORE. ITEM NOT TERRIBLY DURABLE, BUT HAVEN'T FOUND ANY THAT ARE, AND CERTAINLY CAN'T BEAT THE PRICE. Got Ears? Grandad Style Monaural Earpiece With 6 Foot Cord4Mike KFebruary 15, 2011The earpiece came as described as was shipped very promptly. The only drawback is that cord is very delicate and they do not last very long when using them on a regular basis. The sound will cut out after a while of use. They don't seem to last as long as the equivalent from Radio Shack which are about three times the price. Got Ears? Grandad Style Monaural Earpiece With 6 Foot Cord5GMFebruary 1, 2011Works as described. I like these old style buds. Simple, good audio, easy to clean, and a good long cord. I use them with a radio while walking. Keeps one ear clear to listen for vehicles coming. Quality product. Got Ears? Grandad Style Monaural Earpiece With 6 Foot Cord5JerryDecember 31, 2010Received my order without delay and actually earlier than I had expected.